Products — Sun Enterprises USA, Inc. The HS-100 is our best seller and a very popular scoring, creasing and perforating machine. Very powerful with easy setup. Easy to use, anyone can operate it. Accepts up to 12" wide card stock. Score, crease tent cards, wedding invitations, brochures, menus, greeting cards and more. Perforate sales slips, raffle tickets, business forms, carbonless paper and more. Includes one (1) scoring blade and two (2) perforating blades, a 10-tooth coarse and a 14-tooth fine. A scoring, creasing and perforating machine that can meet your needs! 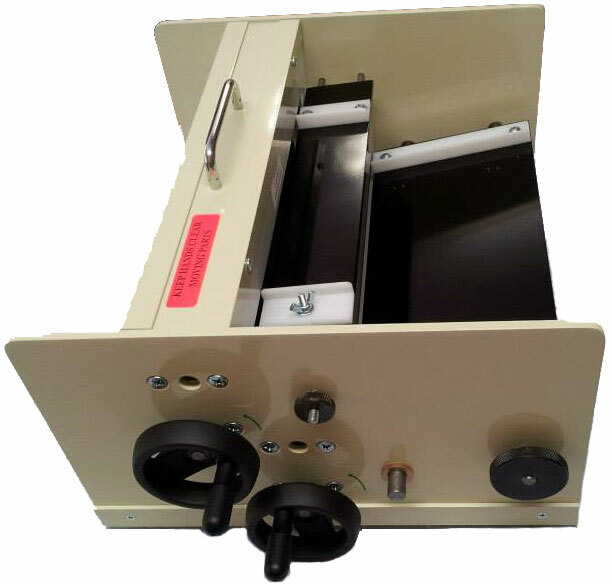 Our number one selling regular cut slitter that is electrically operated and bottom friction fed. This is a 2 machine set-up (1st & 2nd cut) and each unit can be sold separately. 8-up, 10-up or 12-up format from an 8 1/2" x 11" card stock. 2-inch circular high carbon steel self-sharpening blades. Micro-side adjustment to move the card stock right or left for an off-register job. User friendly and virtually maintenance free. Cut any weight card stock that you can print or copy, even UV coated card stock. Produce standard size business cards 2" x 3 1/2"
Cut 1,000 business cards in less than 6 minutes! 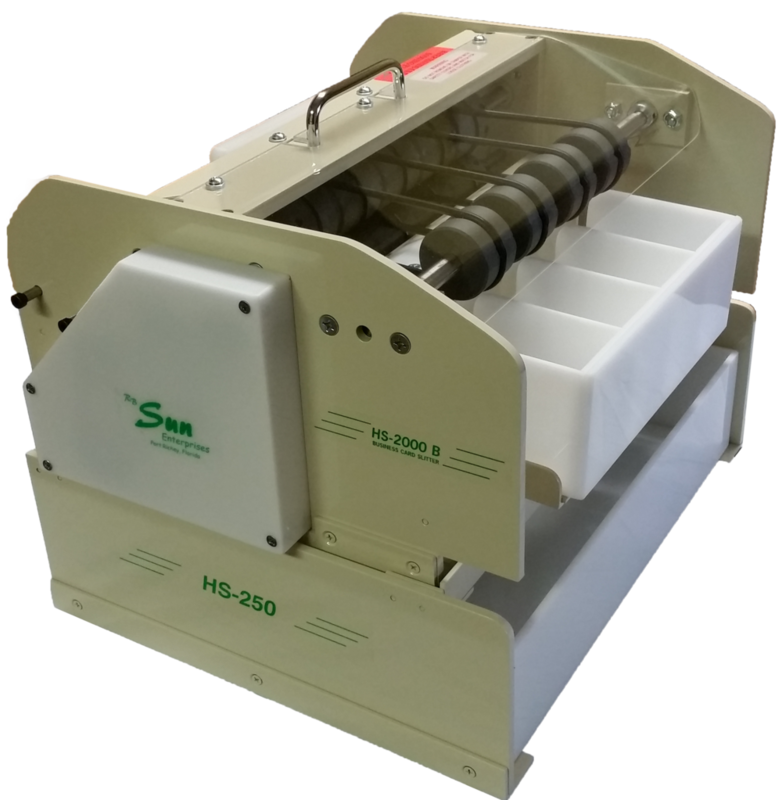 HS-2000B 2nd cut machine which also comes with it’s own stand and trim bin. This is a 1 machine unit. Now you can cut full bleed cards with no problem! All the same features as our regular cut HS-2000AB but in a gutter cut format. Available in 8-up format from an 8 1/2" x 11" card stock, a 10-up format from a 9" x 12" card stock and a 12-up format from a 9" x 12" card stock. Produce standard size business cards 2" x 3 1/2" and remove the inside and outside trim. This is a 1 machine unit that includes the 1st & 2nd cuts right into the machine. Manual hand-operated regular cut business card slitter. For low and medium volume runs. 8-up, 10-up or a 12-up format from an 8 1/2" x 11" card stock. This is a 1 unit machine that includes the 1st & 2nd cuts right into the machine. Manual hand-operated gutter cut business card slitter for full bleed business cards. 8-up format from an 8 1/2" x 11" card stock.